Attention Stampers! The day 25 giveaway was designed for you! It's a little bit of heaven all wrapped up in one giveaway! Are you caught up for 2014? 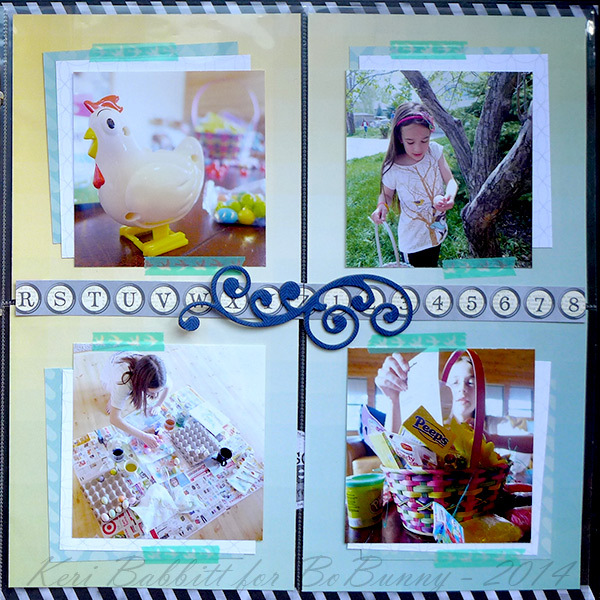 Today Keri will show you how easy it is to keep caught up on your photos for the year using our 12 x 12 Misc Me products!! Keeping caught-up with 2014 has been MUCH easier, thanks to BoBunny Misc Me products. 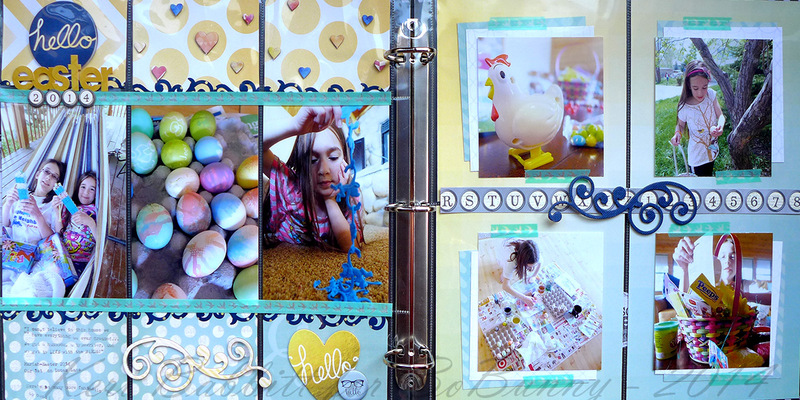 Even with an overly-full schedule, I was able to capture some Easter memories in this quick two-page spread in my 12x12 Misc Me binder. Journaling cards and papers from Modern Miss and Our Lil' Monster coordinated perfectly for my desired color palette of gold, aqua, and navy. I even cut a border sticker in half, by adhering it along the two rows of journaling cards, and cutting down the center with micro-tip scissors. I love the finished look of the tiny scrolls above and below the row of photos. Another quick tip for the 12x12 Misc Me, is to cut an existing 12x12" paper into four 6x6" squares. The gradient effect with this particular paper looks great in the divided page protector. 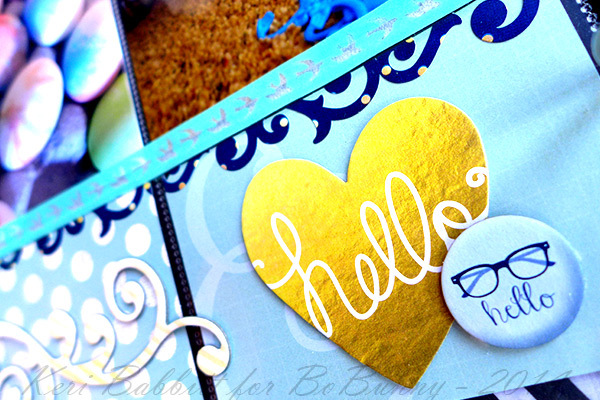 I dressed up the yellow polka-dot cards with some chipboard hearts. A washi tape border over the top of the page protector unifies the design. 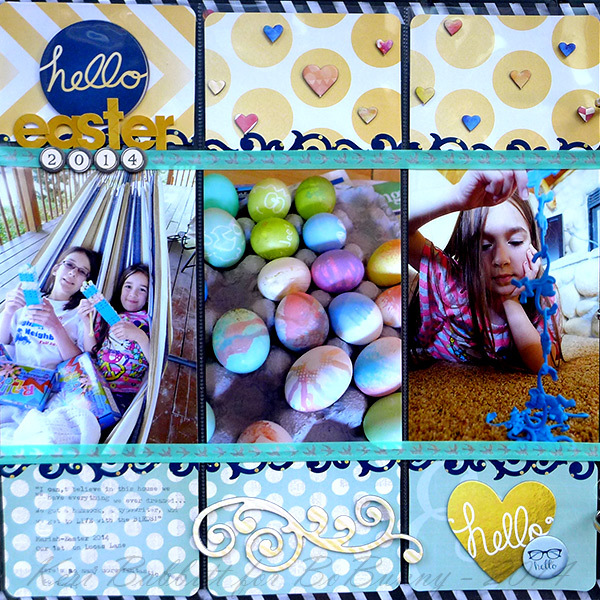 Kerri I LOVE you Misc Me Easter spread.. just beautiful! I would love to use this for scrapbooking and cardmaking. 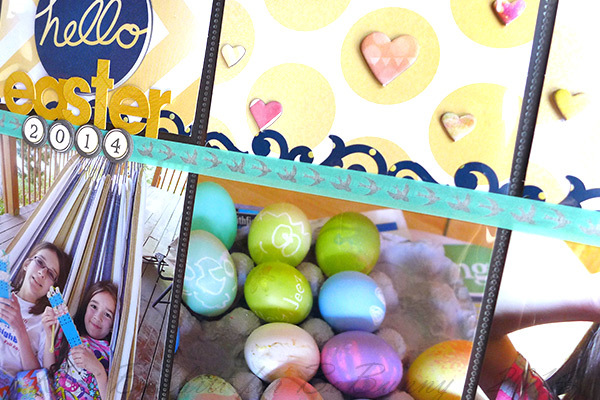 Easter layout is beautiful. I would use the stamps for lots of embossing on cards and scrapbook pages. Thank you for a chance to win this great prize. Wonderful sets of stamps. I love the arrow stamps. Would be great to use on my layouts. Thanks for another day of the giveaways. My favorite way to sue stamps lately is on cards. I love them all, but to pick one favorite ... flourishes & such. Thanks for the chance to win! I would love to use these stamps to add fun elements to cards. I love using stamps to make my own patterned paper! Fun layouts today,looove to win these great stamps! I love all the stamp sets. But right now I'm crazy for arrows. Thanks for the chance to win. My favourite way to use stamps is on cards. Thanks for the chance to win. I love the arrows and triangles. this layout is beautiful. Love all of the colors. Would love to create some cards using these!!! Such beautiful stamps! I use stamps mostly for cards but also sometimes on layouts. Thanks for the chance to win! Pretty stamps, I would make layouts and cards if I won. I absolutely love the first set with the hanging sign. i would love to win these to use on my scrapbook layouts. thanks for the chance to win! I would use those stamps for so many projects. very awesome sets!! I'd use the stamps on cards! Love them! Love the layouts. So pretty. I just adore the stamps. Thank you for a chance to win. My favourite way to use the stamps would be on cards and my layouts. Love the page layouts! If I won, I would use these in a mini album. Great layouts, Kerri....'love the colors, too. Oh, I would use the stamps for layouts and cards for sure. Thanks for the chance!! I would use these stamps to make some fun birthday and wedding cards this summer. FUN & FABULOUS Misc Me pages!!! FUN & FABULOUS goodies today too!!! I would use the stamps for making scrapbook page embelllishments and cards. Thank you for the chance to win this awesome prize bundle. I like the Flourishes and Such, too! They would come in handy! I would love to use these stamps for pocket scrapbooking in my Misc Me binders. I love Bo Bunny stamps!! Great layouts, Kerri! I love all the stamp sets. Thanks for the chance to win! Wonderful stuff. You have some of the best stamps around just now too...and yours are my favourites. SO hoping I'll be lucky and win these. Love them all. Thanks for the chance to win. I'd use these stamps for cardmaking and I'd also use them to make scrapbook page elements. Great projects and LOVE those stamps!!! I can think of lots of ways to use the stamps - cards - layouts! Love them! Great layout...... and I LOVE the stamp sets! Fantastic pages such great photos. I'd love to use these stamps on cards. Have been a fan for many years. Love the stamps! I think I like the numbers or the arrows the best. I love flourishes, it's so easy to make a beautiful card or layout and they are so simple! Woooo! I love paper! !!! !